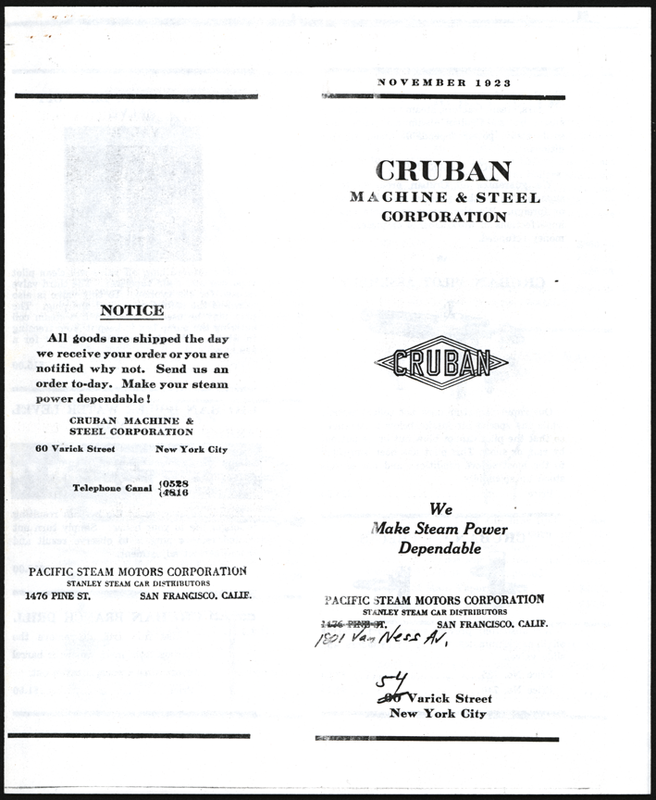 Cruban Machine and Steel Corp. The Cruban Machine & Steel Corporation's history is yet to be written. 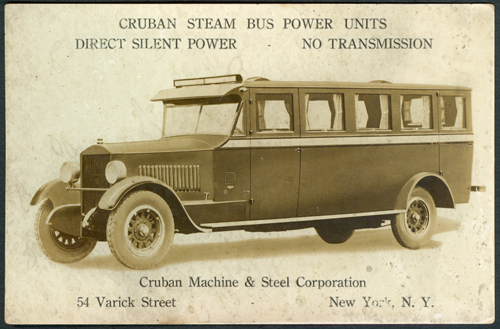 CRUBAN initially started as the CRU Patents Corporation of NY, with "CRU" apparently standing for the initials of Charles R. Uebelmesser. Uebelmesser and his associate, William Wenderhold, assigned to this company twenty-one patents dealing with film projection equipment (projectors, lamps, etc.) between 1920 and 1922. 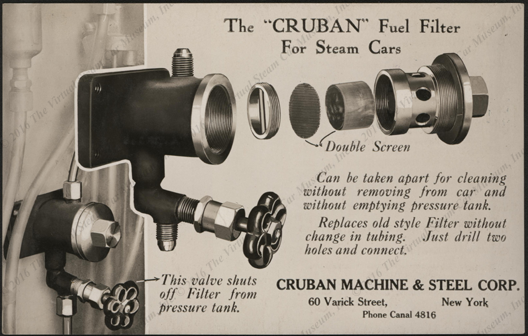 Sometime after 1922, they joined forces with Edwin & Alfred Banzhaf - the "BAN" in CRUBAN probably comes from Banzhaf - and began producing steam car components. The Banzhaf brothers and Wenderhold were all of German descent, but were US-born citizens. Uebelmesser was a German national, and thus even though he appears to be the company's chief engineer, many of the earlier firm's patents were issued to Wenderhold, who was a US citizen. During the war, the intellectual property of Germans (and other Axis nationals) could be confiscated under the Alien Property Act; hence Uebelmesser probably adopted a low-profile during the war years. Uebelmesser & Wenderhold received 15 steam-related patents between 1925-1932. Uebelmesser and both of the Banzhaf brothers died between 1931-1932, which apparently lead to the demise of the company. 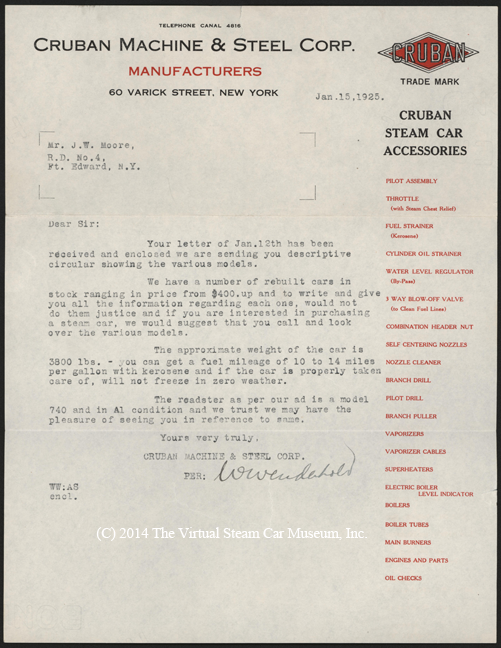 CRUBAN apparently had high hopes and expectations for its Empire Steam Car, but many former Stanley dealers grew exasperated waiting for it. 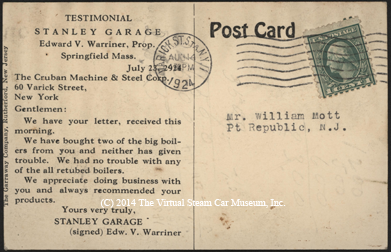 One of whom was Frank Duveneck, a San Francisco Stanley dealer, who wrote to his New Zealand friend, Hector Halhead "Steam" Stewart, in September 1926 that Cruban was trying to get his car business on the road. 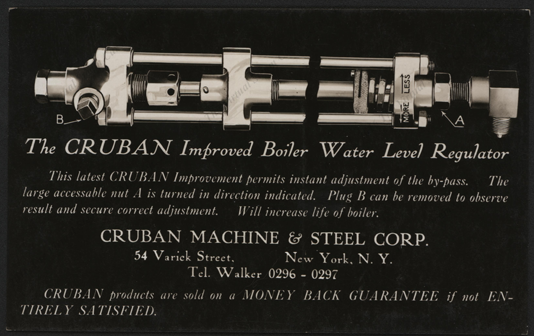 The Cruban Machine & Steel Company used postcards to advertise its products, as well as several brochures. The VSCM collection is arranged in chronological order. Karl Petersen has published some of these in The Steam Automobile. There are a number of patents associated with Cruban. The VSCM invites a motivated researcher to partner with it in gathering and publishing information on this firm. This Cruban postcard shows the Company's pilot. 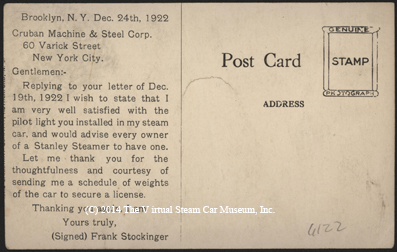 One Frank Stockinger provided the December 24, 1922 testimonial for the product's use on his Stanley Steamer. 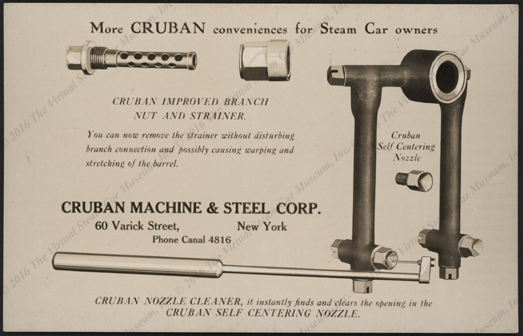 This Cruban postcard shows the Company's branch forks and nozzle cleaner, as well as the Cruban Improved Branch Nut and Strainer. 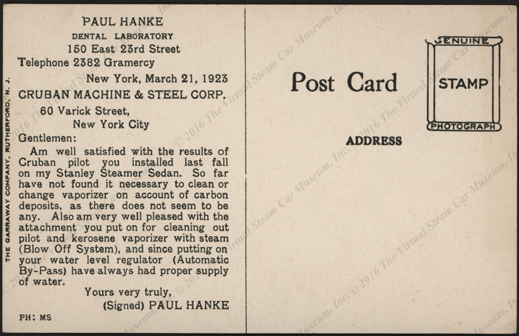 One Paul Hanke provided the endorsement for the product's use on his Stanley Sedan. 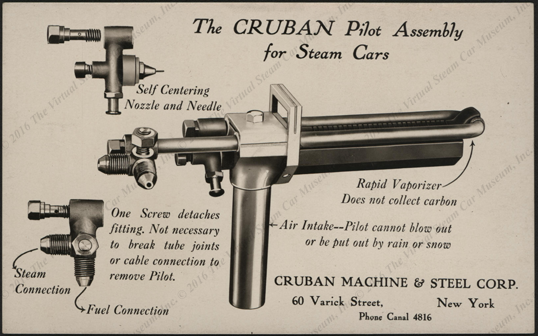 This Cruban postcard shows the Company's pilot. 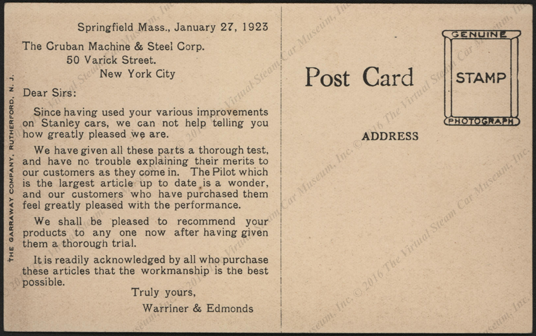 Warriner & Edmonds provided the Manuary 27, 1923 testimonial for the product's use on his Stanley Steamer. 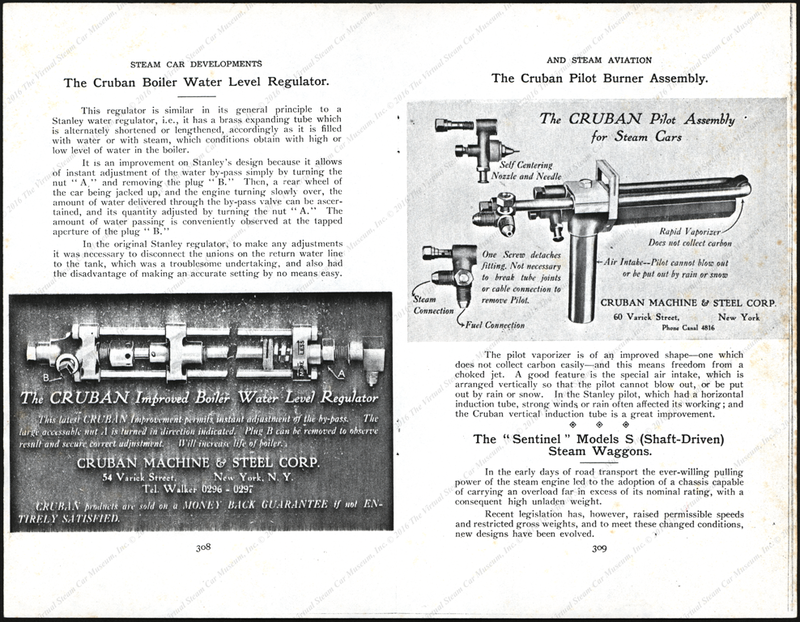 In November 1923, The Cruban Machine and Steel Corproration published this catalogue of its products. 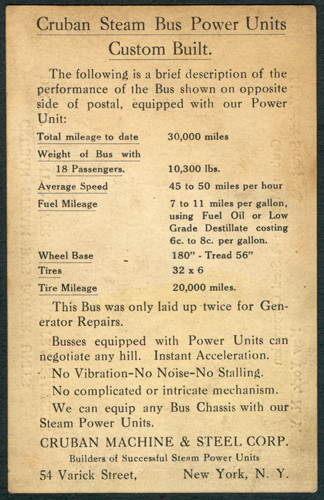 The January 1965 issue of The Steam Automobile featured a copy of the November 1923 brocure. 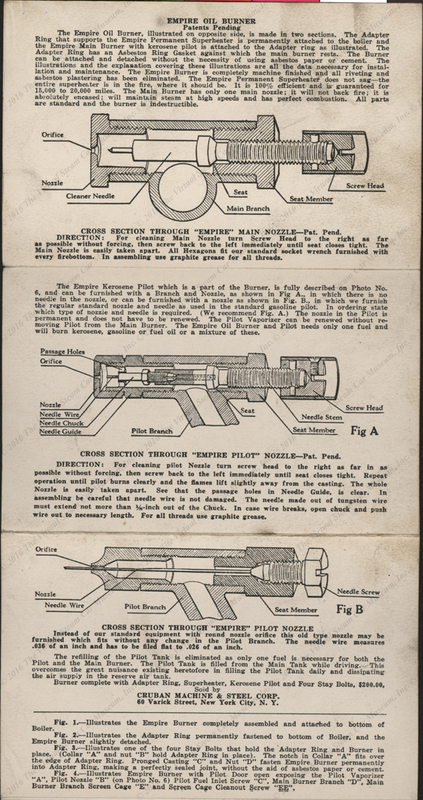 This photocopy of Cruban's November 1923 brochure carries the stamp of Frank Duveneck's Packfic Steam Motors Corporation in San Francisco, CA. Note the hand written address change to 54 Varick Street. 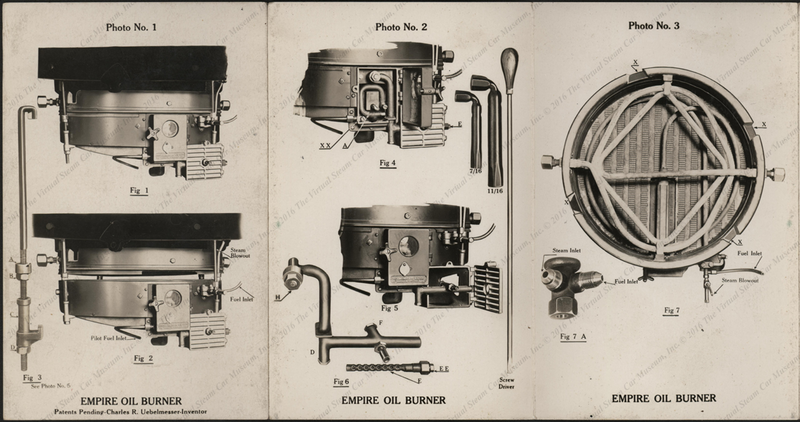 Cruban created this six-fold brochure to illustrate its Empire Burner. The earliest testimonial is May 12, 1924. 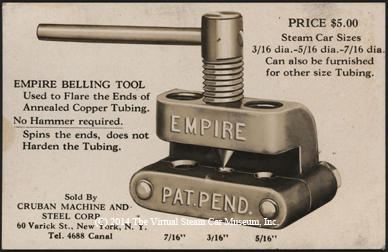 This Cruban postcard shows the Company's Empire Belling Tool, or flaring tool. One Edward V. Warriner of the Stanley Garage in Springfield, Mass. endorsed the product on July 23, 1924. On November 24, 1924, Wm. 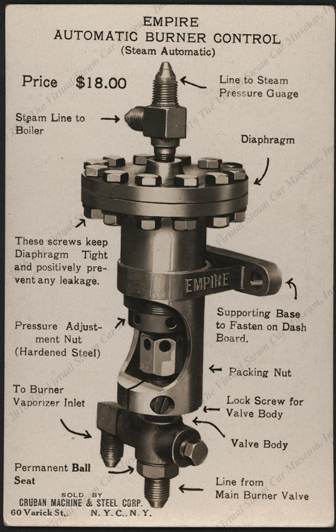 Pierce of Milwaukee, WI endorsed the Empire Safety Valve. 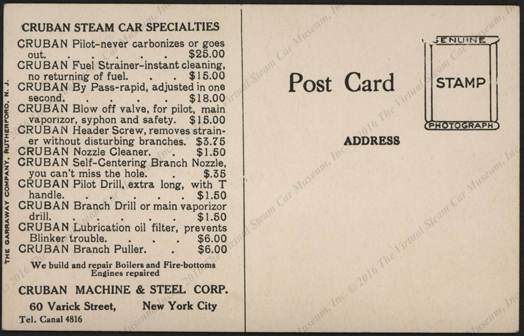 This card promoted the Cruban Fuel aFilter for Steam Cars. It listed the company's products and prices. 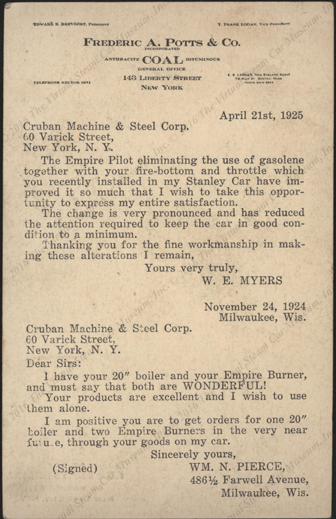 Cruban wrote to Mr. J. W. Moore of Ft. Edward, NY inquiring about fitting an Empire Burner to his steam car. 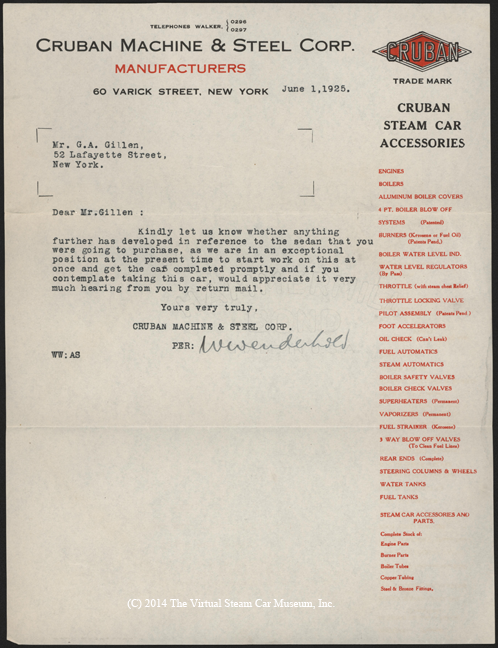 This June 1, 1925 letter too Mr. G. A. Gillen of New York suggests that Gillen was about to purchase a steam car, probably a Stanley, and that Cruban was to refit it with an Empire burner and perhaps other Cruban/Empire parts. 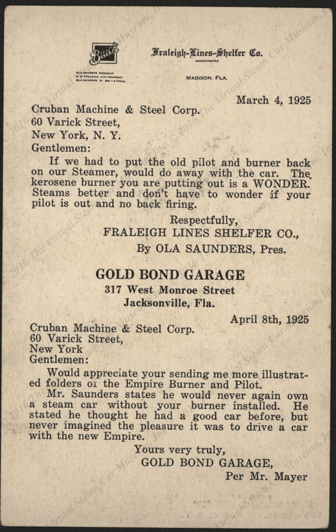 Empire Automatic Burner Control received the endorsement of Ola Saunders, the president of Fraleigh Lines Shelfer Copmany on March 4, 1925. 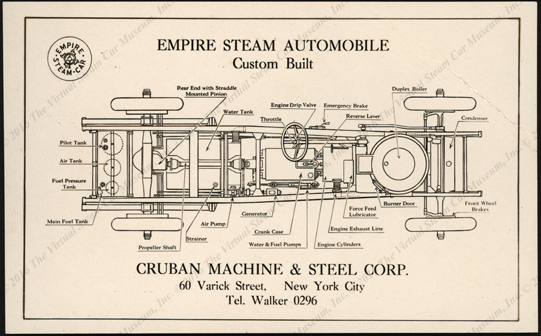 This Cruban card shows the Empire Steam Car chassis, probably about 1926. 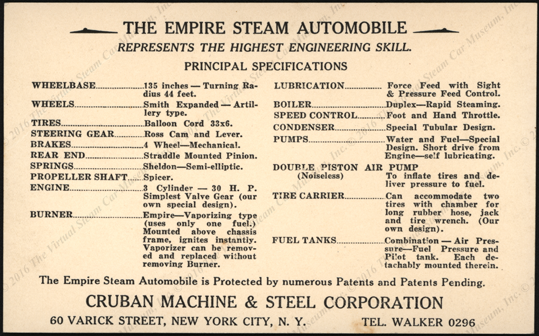 This Cruban card shows the Empire Steam Car chassis, probably about 1926. Note the address change to 54 Varick Street in New York. 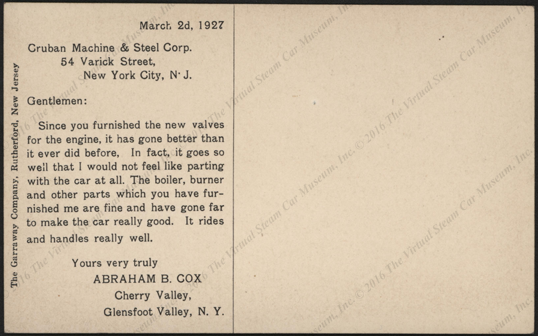 Abraham B. Cox of Glensfoot Valley, NY wrote this testimonial for the Cruban Improved Boiler Water Level Regulator on March 2, 1927. 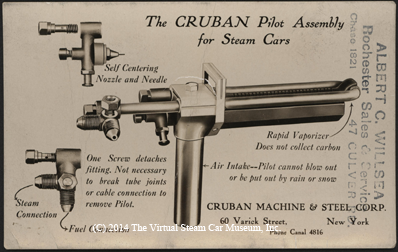 This two page article in Steam Car Developments and Steam Avaiation shows the "Cruban Improved Boiler Water Level Regulator" postcard and the "Cruban Pilot Assembly for Steam Cars" postcard. The date of this journal is not known. Floyd Clymer reprinted this two two-page article from the Scientific American. It apparently shows the Cruban steam bus in operation. See Hector Halhead Stewart's Cruban material. 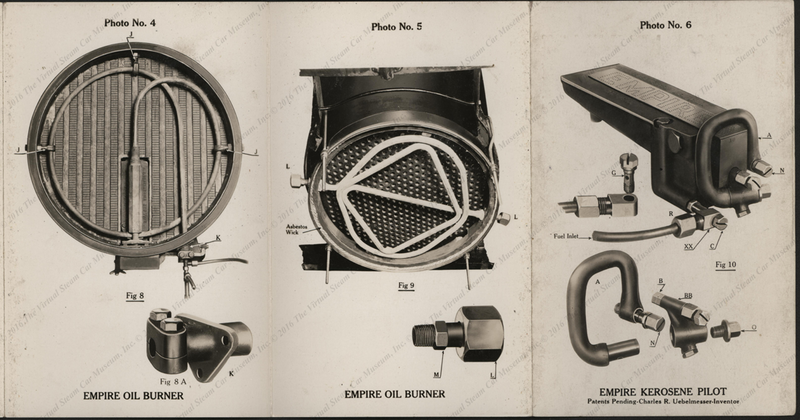 For a wonderful description and superb photographs of an Empire (Cruban) burner, see Bob Wilhelm's web site. James Merrick, the part time librarian for the Stanley Museum in Kingfield, ME posted this information February 18, 2003 07:47AM on the www.stanleysteamers.com. While James Merrick does not cite his sources, he is an impeccable and extraordinarily trustworthy researcher. This is an excellent start on which to build a history of Cruban. 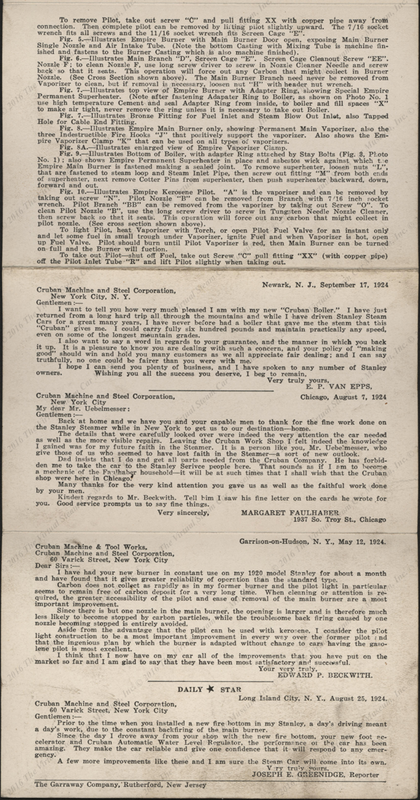 Frank Duveneck to H. H. Stewart, September 22, 1926. This quote is drawn from Hoke, Donald R., Hector Halhead "Steam" Stewart: The History of Stanley Steam Cars in New Zealand and More, (Dallas, TX, The Virtual Steam Car Museum, Inc. 2016). Petersen, Karl, "Cruban - Making the Stanley Practical," The Steam Automobile, ____________, pp. 16 - 20?. 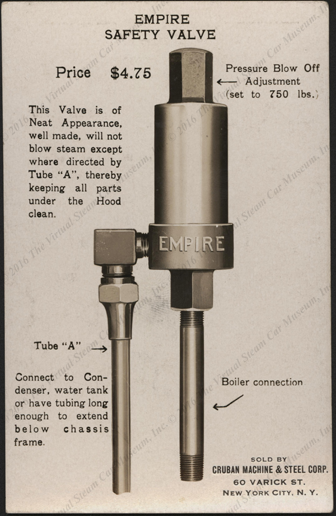 The January 1965 issue of The Steam Automobile featured a copy of the November 1923 brocure. Contact us if you have additional information about the Cruban Machine & Steel Company, or if you have questions.